Welcome back to my happy place. 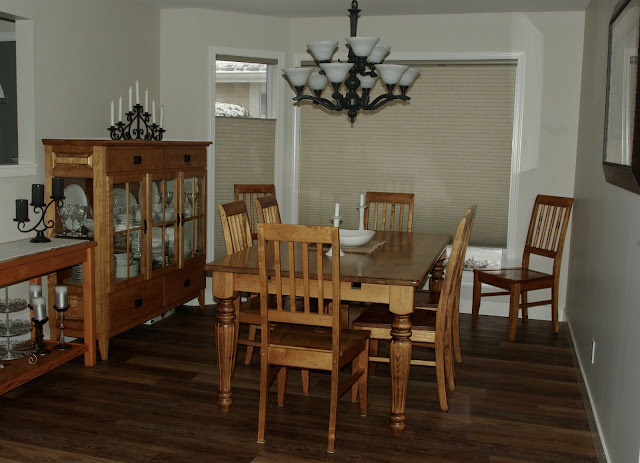 The day I originally posted our kitchen renovation the window treatments were being hung. One of our commenters asked what we chose, so I thought I'd give you another look. We have a lovely view from the large windows all across the back of our house and from the corner sink windows above the sink which we wanted to maintain, but we also wanted the flexibility of privacy as well as energy efficiency. We chose Hunter Douglas top down bottom up pleated shades throughout the whole house. Some have a remote for easy use. As you can see in the photo they can be positioned at various heights, or all the same. It's been a good choice for all the needs we had. Behind the wall of the fridge and oven is our dining area. This space fit the furniture we brought from our last home. We still have the room to add two leaves to the table and seat 12 comfortably. Since the living area is on this side of the table it allows us room to add an extension table to this end, giving us room to seat 16. Not much else has changed since my previous post except that our home is becoming well seasoned with visits from family and friends. 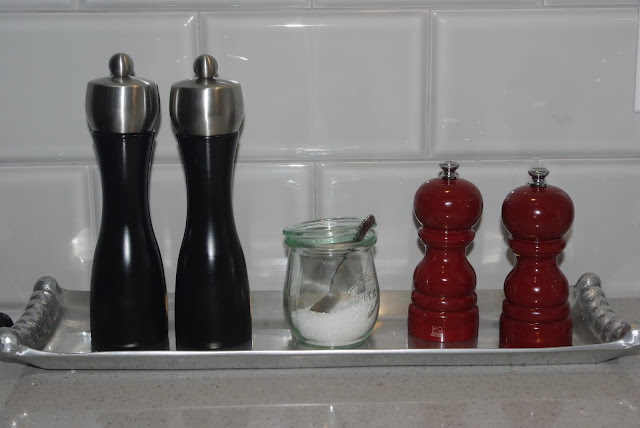 if you don't have salt and pepper mills, I recommend that a good set is well worth it. Today I'd like to acknowledge one of our Mennonite Girls Can Cook blog sponsors. Winks Home Garden and Gifts is a beautiful shop in Chilliwack BC, and they carry these Peugeot pepper and salt mills in a variety of colours and sizes. Peugeot mills make a lovely gift, and at Winks you will always leave with your purchase beautifully gift wrapped. At Winks you will also find our cookbooks tucked into their beautifully merchandised shelves. From a heart of kindness, care and generosity Winks uses all proceeds from cookbook sales to help those in need. Thank you for your ongoing support Winks! Beautiful reno! From where did you purchase the kitchen cabinetry? Quartz? Old World Kitchens in Chilliwack. Yes, it's quartz. I am so glad to hear that you love the top down bottom up pleated shades. We would like to install something like this in our south facing bay window. We don't need the privacy out here in the country, but the sun damage to our furniture and carpeting has become a problem. I like the look of these very much! Your home is just beautiful and I know that anyone entering is a very welcome guest with amazing hospitality! Wish I had a Winks over here ... such a great shop! Thank you for visiting my blog. I love your kitchen renovation! I have also just gotten done looking at some of your recipes and they all look so delicious! 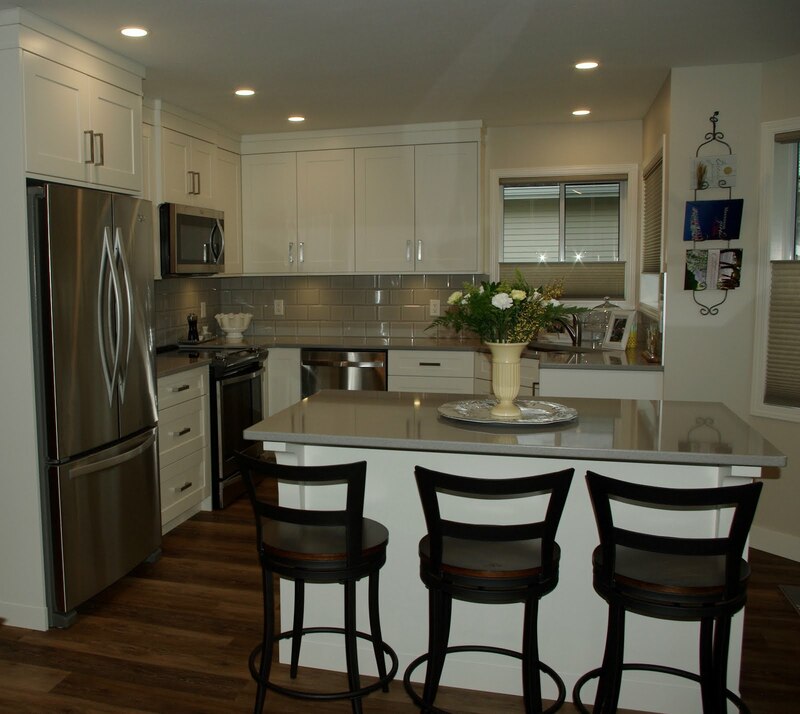 I am sure you will have many wonderful cooking experiences in your new space! Enjoy! We did the top down bottom up blinds in our daughters room. I ordered mine from Costco online! The blinds and price are great!